Sergio Encarnación has a well-defined goal, to find the proteins encoded by 237 genes, and which exist within human cells. It does not sound so complicated, until we know the rules of the game. They can not be any protein, they are all known by first and last name, and they have to be those that are on the list. Not all will be present in any human cell. And you have to trap them one by one into a haystack that contains about a billion other proteins, that is, a human cell. “It’s as if I had to catch you specifically, from all humans. And I’m standing on the moon, “explains Sergio, a CCG researcher in the Functional Genomics group. In 2010, during a conference in Sydney, Australia, an international group of protein experts was formed and adopted the name of the Human Proteome Project (HUPO). Its mission is to describe and find evidence of all the proteins that can come to exist within a human cell. On June 26, 2000, at an international press conference, the then president of the United States, Bill Clinton, and the British Prime Minister, Tony Blair, announced that the Human Genome Project had been completed. But we were far from fully understanding ourselves, molecularly speaking. While the information of a genome can be seen as the cooking instructions to make an organism, there are still some spices that are hidden from us. Who carries out the recipe are not genes, but proteins. And if we want to understand how a human becomes, how he responds to the environment and certain diseases, then we must know his proteome. “The HUPO consortium is made up of 25 groups – one group for each chromosome, plus one coordination group – from different parts of the world,” explains Sergio. I ask him what are the challenges of working on a project like this “it’s complex,” he replies, “everyone has a different vision. But that is also what enriches work: learning different ways of seeing the same thing. In addition, I have the pleasure of working with leaders worldwide. ” All this forms the indispensable conditions to be able to complete a project of this caliber. Deciphering the human genome was a watershed in biology. Describing the whole proteome is a completely different challenge. To begin with, any human cell has within it, the same DNA as the rest. And it contains it completely, no gene is spared. With proteins, the same thing does not happen. A cell of the heart is not the same as one of a bone, or one that forms that small mole in the person we like. They all have the same DNA, but what makes them different are their proteins. So, to know all the proteins, you have to study all types of cells. “And all the conditions to which they can be subjected – Dr. Encarnación comments – there are certain diseases that modify our proteins”. It may change its shape, its size, or simply whether they are present or not. To attack this great challenge, the HUPO decided to form teams and assign each one a human chromosome. “We are in charge of finding all the hypothetical proteins that can be encoded within chromosome 19. It is the second largest in terms of number of genes -and that is the fourth smallest- confesses Dr. Encarnación. “This chromosome codes for 1429 proteins, but many of us already know them, there is evidence of them. We must find the proteins encoded by 237 genes, of which there is no convincing evidence that they exist”. So far those proteins are hypothetical, in theory, they should be there, they just have not been caught. This may be because they are only expressed in certain conditions of development, or during illness. Or they may just be a bad prediction of our genome analysis. 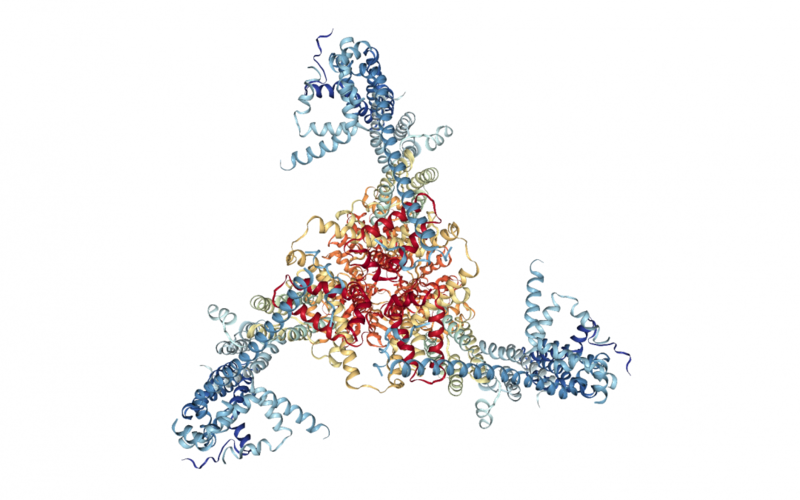 “Most of these proteins, about one hundred, are zinc fingers” so called because of their shape and composition, and typically regulate other genes. “Another important group,” Sergio continues, “are olfactory receptors” that is, proteins that help us perceive odors. proteins he is looking for are very similar to each other, therefore, he must use techniques that allow him to separate with great detail all the proteins that have the same characteristics. As if he managed, from the moon, to distinguish all the members of the same family. Dr. Encarnación has two great advantages in his favor. He has extensive experience in this type of techniques, and his laboratory has just received a state-of-the-art Mass Spectrometer. This device not only allows you to generate enough evidence to say that you have a specific protein, but also allows you to know its sequence, that is, to know your name and surname. And this brand-new laboratory equipment presumes to have a resolution of hundreds of thousands of proteins per cell sample. All this work does not fall entirely on Dr. Encarnación: “For this project my working group is made up of students from my laboratory such as Ramiro Alonso and Alberto Checa”. In addition, it also has collaborators in other national institutes such as Leonor Jacobo of the National Institute of Genomic Medicine and Rafael Palacios of the International Laboratory for Human Genome Research. The Human Proteome Project is expected to end in 2020. Surely it will be a great achievement, as Sergio Encarnación says, but it will also show us that there is still much to know. Text: Agustín B. Ávila C.